Researches in child development have shown that play activities enhance every aspect of a child's mental and physical growth. Important social skill is developed in children while they play with their favourite toys. Play also helps improve their visual and auditory senses. 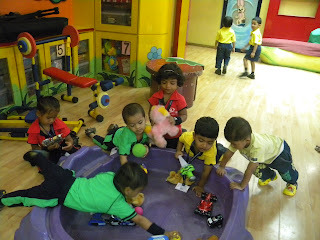 WIS Nursery section celebrated favourite toy day on 26th June, 2012. This is the only day where children can bring their favourite toy to school. 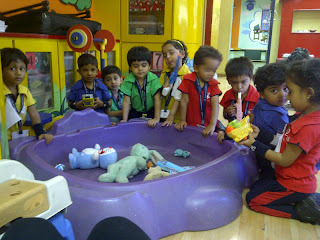 Children placed their toy in a pool and when it was their turn children showed their friends which toy they have brought and tell something about it, and why it is their favourite toy. After show and tell children were allowed to play with their toys, and share their toys with their friends.